Frankenstein’s Monster Pudding Cups are the perfect treats for kids! Your kids can help make them and then gobble them up! Ugh! I have a cold! I just want to lay in bed, but, instead, I bring you HALLOWEEN TREATS WEEK!!!!! How is the unofficial end of summer here already? It’s like a slap to the face I tell you! I just don’t want to believe that the days are getting shorter (you know what I mean), it’s already getting cooler in the mornings, and before I know it I’ll be muttering swears under my breathe as I shovel snow off the walkway in front of our house. Or my favorite, mop up melted snow water that sneaks away from the mat at the front door in hopes that the bamboo floors don’t get water damage there. Seriously, thanks previous owner- it was super smart to put a sensitive wood right at the door in a climate where is snows for like 8 months of the year. dumb. And that’s just the beginning of the crap they didn’t or did do. Since September is just about here I am making this ‘The Next Best Thing to Robert Redford Pie’ because it’s Price’s favorite pie and his birthday is coming. So let’s pretend this is an early birthday pie. Or is it a late birthday dessert since I never made him the German Chocolate Cake brownies that I owe him for his 2013 birthday. I am the worst. Anyway, this pie is great. I had never heard of it before Price asked for it years ago. I did manage to make it for him in a somewhat of a timely manner then. ha! So you should do yourself a favor and make this asap since it’s the bee’s knees. The first piece kinda has to be scarified since it just doesn’t come out of the pan that nicely so that is the one you get to set aside for a midnight snack. Or you can eat it for breakfast, like what Price did. Now that is not the worst. Combine the flour, butter, and chopped nuts. Press into the bottom of a 9 x 13 x 2 inch pan. Bake for 25 minutes, or until golden brown. Set aside to cool. The the bowl of a stand mixer/large bowl, beat together the cream cheese and sugar until fluffy. Add 1 container of whipped topping and mix until combined. Spread evenly over the cooled crust. Attempt to not kill Pricer for screwing it up!! 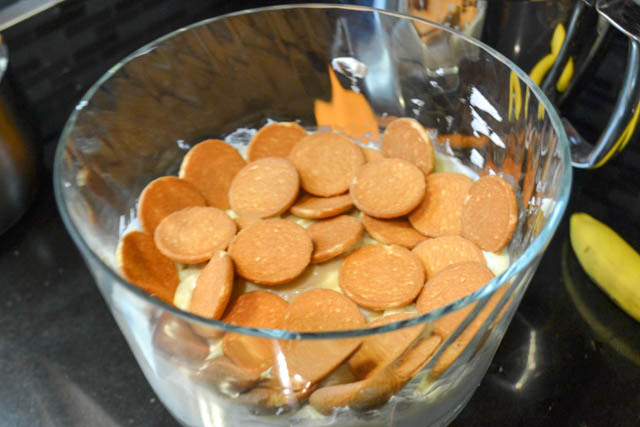 In a large bowl, combine the pudding mixes and milk well until thick. Spread evenly over the cream cheese filling. Spread the remaining container of whipped topping over the pudding layer. Sprinkle grated chocolate over the top. Refrigerate for 6 to 8 hours before serving. I am just itching to go on vacation. At the very least planning one would cool my wanderlust urges. I just love adventures and times to relax in a new setting. I love to discover new places and try new things. As well, I’m waiting for Jet Blue to release more dates next year so that Emily and I can have a girl’s weekend. I can’t wait to check out Seattle and have her show me all around. Everything she has been telling me about the PNW sounds awesome. I think it will be such a fantastic time. yay! Anyway, let’s check out this awesome pie for Pieday Friday! 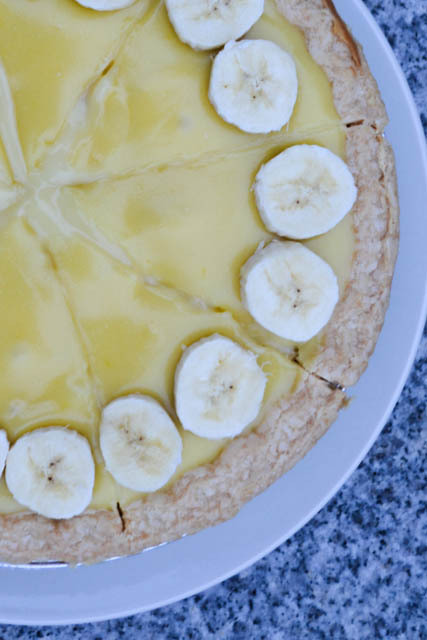 This banana cream pie should be illegal. It’s that good. Really really good. The flavor is so good. 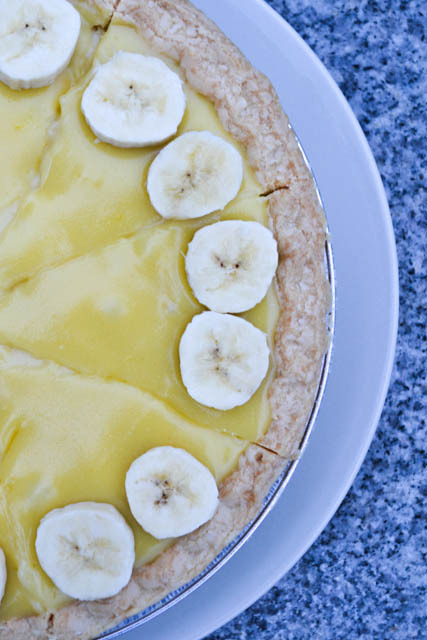 The silky smooth pudding filling is a great companion to the fresh bananas. Price came back from work and I basically shoved a spoonful of the pudding into his mouth the moment he walked in. I don’t think he minded though. Well, maybe it was a tease because he had to wait for it to set up. ha! I suggest that you make the pie well in advance of serving it. You can let it chill for an hour but I think that the longer the better. Then you garnish it right before serving so the bananas don’t brown. And I think that some whipped cream is great for a garnish as well. yum!! What pies should I make next? I’m taking suggestions!! Bake the pie crust according to the packaged instructions/recipe. Let completely cool. 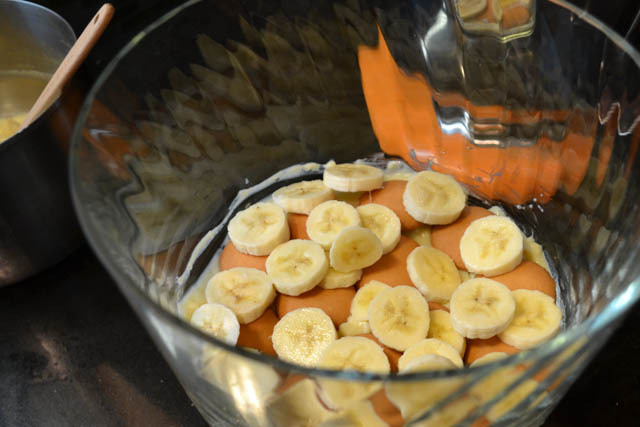 Slice 4 of the bananas into 1/4″ thick rounds. Set aside. In a medium-sized saucepan, combine the sugar, flour, and salt. Gradually pour the milk in while stirring gently. 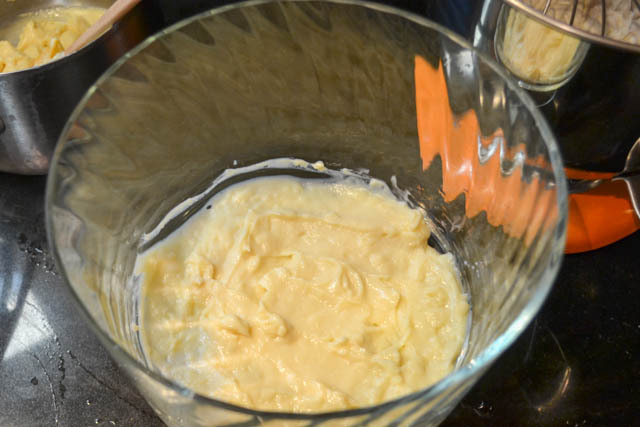 While continuously whisking, cook over medium heat until the mixture is bubbly. Keep stirring and cook for about 2 more minutes, and then remove from the burner. Mix a small quantity (about 1/3 cup) of the hot pudding mixture into the beaten egg yolks, and immediately add egg yolk mixture to the rest of the hot mixture. While continuously whisking, cook for 2 more minutes. Remove the mixture from the stove, and add butter and vanilla. Stir until the whole thing has a smooth consistency. 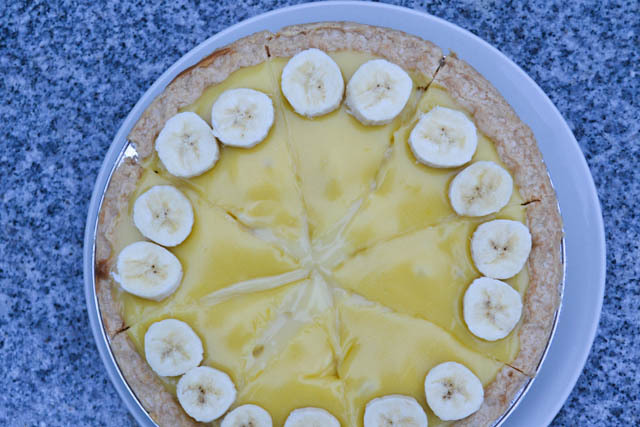 Place the banana slices in the cooled baked pastry shell and then top with pudding mixture. Bake for 12 to 15 minutes. Chill for 1 hour before slicing. Garnish with the remaining banana prior to serving. So I was doing a really good job of doing weekly posts for my Sprint Cup Snacks series last year, but then tragedy struck!!! My damn desktop crapped out on me. And where were my photos that I needed to edit and slap into my drafted posts? Oh, on the damn desktop! So bam! My posting schedule hit a speed-bump, so I had to face the I would just have to redo some recipes I already made. And of course instead of attacking them quickly I fell behind on my posts, and then got busy, and then had a baby… well you get the point! And since Daytona is next Sunday (yay!!!!!) I just knew I had to get into gear (see what I did there?) and finally get around to posting the last few recipes that I had passed up last year. 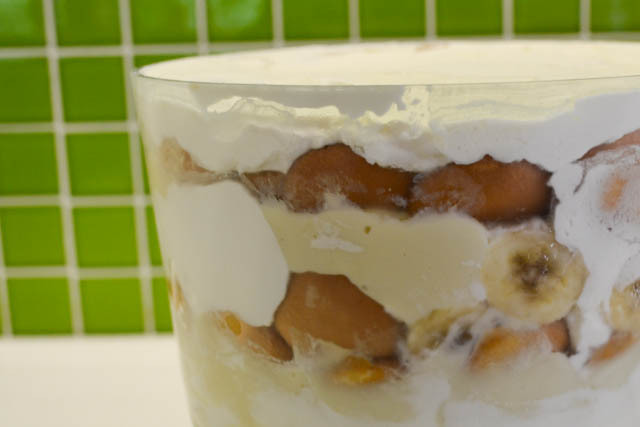 I’m kicking things off with this delightful Banana Pudding that I made for the Coke 600 race at Charlotte Motor Speedway way back in October. I had to pick something super southern to honor this race. 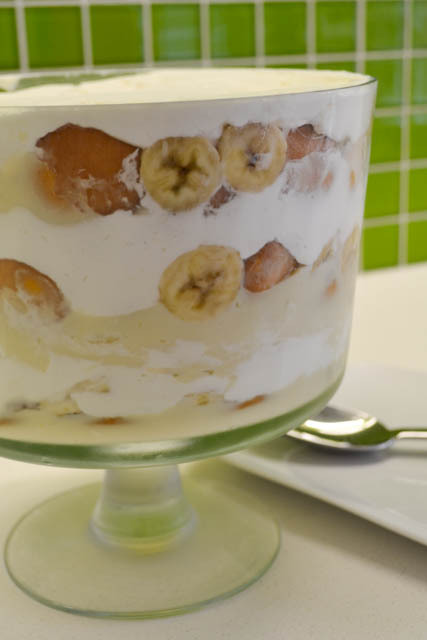 And Banana Pudding was the perfect pick! I had made this and brought it into work and one of the guys there was saying how great it was. Well, that was nice of him. What I didn’t know was that he was from the South. He continued on saying how he grew up eating Banana Pudding and how this reminded him of his childhood and how good this Banana Pudding was. Well… score!!! yay!!! And I think we all need more pudding in our lives. Just because. And I think we can justify having this as there is fruit involved. Totally healthy. And it does has reduced fat vanilla wafers, which really just does a better job of holding up the wafer texture better than the regular vanilla wafers, but still… ha! 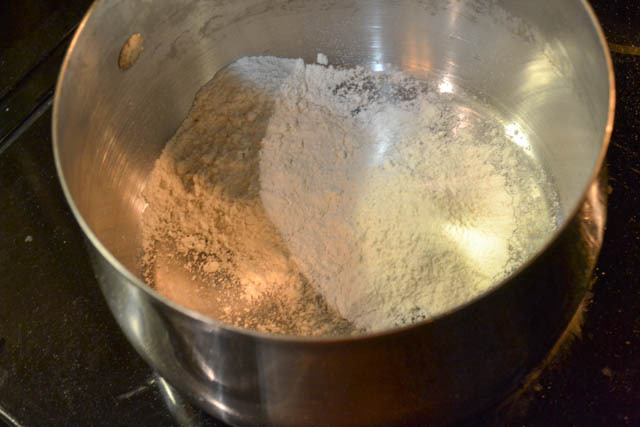 In a medium saucepan, combine the flour and salt. Place on your stove-top over medium heat. Gradually stir in the milk, sweetened condensed milk, and egg yolks, and cook, stirring constantly, for 8 to 10 minutes or until thickened. 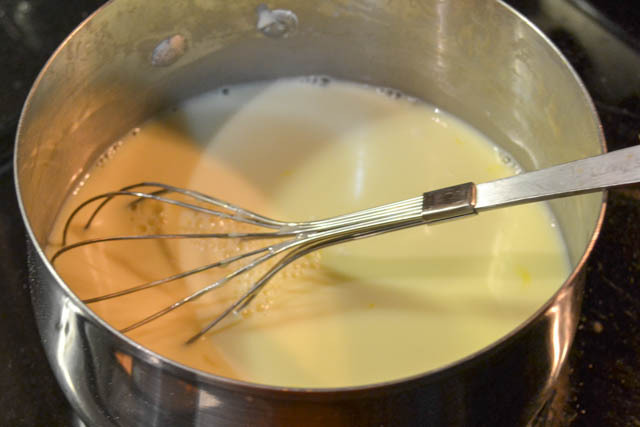 Remove the custard mixture from the heat and then add in the vanilla extract. 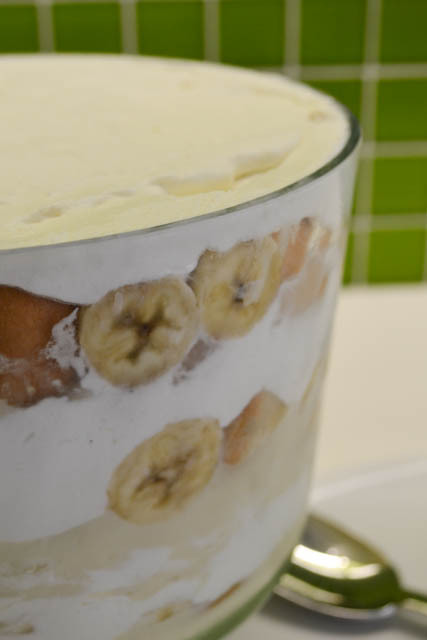 In a 5 quart trifle dish, out 1/3 of the pudding on the bottom of the trifle dish, then 1/3 of the vanilla wafers, then 1/3 of the banana slices, and lastly 1/3 of the whipped cream. 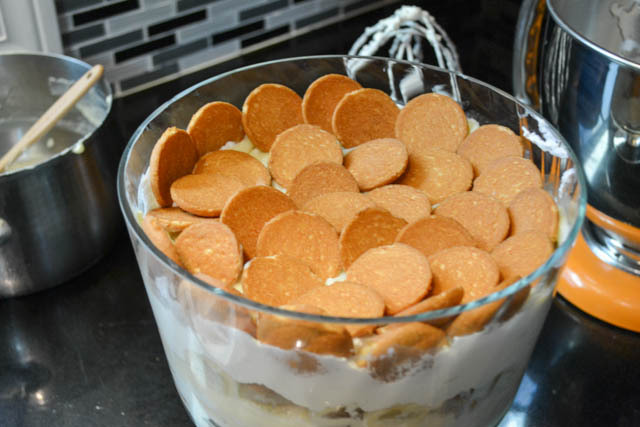 Be sure to place some of the pudding, banana slices, vanilla wafers, and whipped cream along the side so everyone sees the yummy layers. Repeat the process 2 more times topping off with whipped cream. If you are serving these individually, then just serve in 1 cup dishes or in pint ball jars. Layer the ingredients in the process stated above to create a dessert with 6 layers. Once you try these Chocolate Chip Pudding Cookies, you’ll insist on making cookies with pudding in the mix again and again. It has magical powders. So, Price and I typically don’t keep the heat on very much in the house in the winter. That’s crazy, I know. In fact, we just deal with it and bundle up in layers. As a matter of fact, LOTS OF LAYERS. There are times when we look like Joey from Friends when he dressed up in all of Chandler’s clothes.